This post is sponsored on behalf of the Tart Cherry Marketing Institute. All opinions are 100% my own. I like to think that I know a thing or two about car trips. Every summer when I was a kid, my family would load up our giant conversion van with suitcases, pillows and a giant cooler full of sandwiches and snacks. We drove from Ohio to Florida, New Orleans and the East coast and pretty much everywhere in between. My mom was the queen of road travel and made sure that we had everything that we could possibly need – especially in the food department. Snacks, drinks, fruit, treats were all lovingly packed away in our 80’s mustard yellow cooler and jammed between the two front seats of the van. I am happy to be carrying on the tradition of car travel with my kids. My in-laws live about 8 hours from us and we happily make the trek multiple times a year, as well as anywhere else we want to go. While I’m getting more acquainted with flying in recent years, car riding is second nature to me. Packing up and hitting the road is just our way of life, and I truly love it. This weekend I had the chance to drive to Cleveland for a fun trip and I was excited to gather my car-ride essentials: fresh audio book selection (Hello, Outlander Drums of Autumn), new podcasts (loved the new episode of Chopped Podcast), sun glasses, coffee and of course, car snacks!! When it comes to car snacks, I like something that is easy to eat one handed, has a variety of flavors and textures so that I don’t get bored, and it must be satisfyingly filling. Enter my Tart Cherry Trail Mixes! These are the best on-the-go snack I can think of. No mess, simple to put together and each variety has a range of flavors and textures so there is no snack regret later on wishing I had gotten something different. 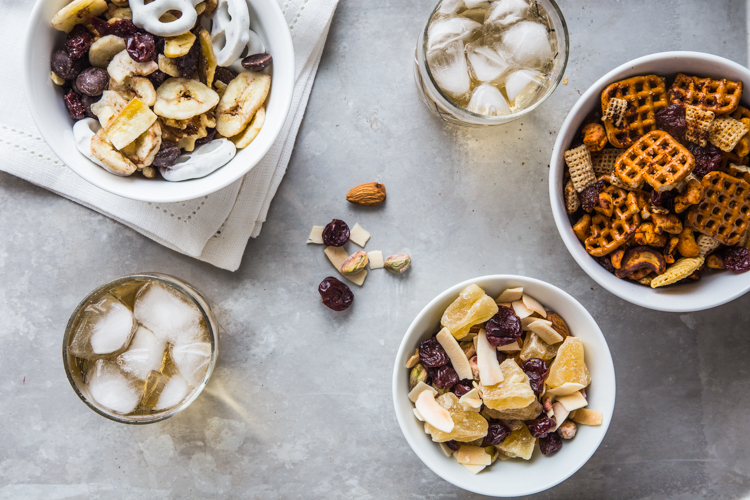 My favorite plump, dried tart cherries are the star of every single trail mix combination. I’m endlessly amazed at how well tart cherries go with such a variety flavors and ingredients. Plus, they add a punch of antioxidants to any snacking situation. Just look at their amazing color! The South of the Border variety has a salty/spicy/tart combination that hits the spot when I’m craving a savory snack. The Trip to the Tropics is all about fruit and nuts and is light, bright and tangy. The Banana Split is what I reach for when I want a sweet treat. The combination of the yogurt pretzels, tart cherries and dark chocolate chunks is just too good! In addition to tucking these mixes into my travel bag, I’ve been packing them into A’s morning school snack. He has informed me that his favorite is the Trip to the Tropics and I can’t say that I blame him. The combination of pistachios and tart cherries is unbelievably good. Remember when I used that combo in my Tart Cherry Chocolate Bark? Ah! So good. I’m thinking these Tart Cherry Trail Mixes will be great to pack for the kids’ summer camps this year. Because of C’s peanut allergy, I easily made versions that were nut-free by leaving the walnuts out of the Banana Split, swapping roasted pepitas for the cashews in the South of the Border as well as both types of nuts in the Trip to the Tropics. 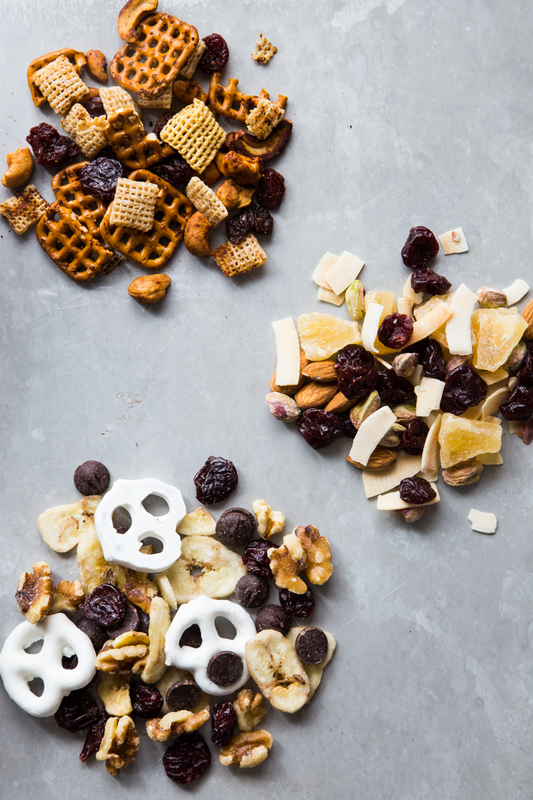 There are endless possibilities for these Tart Cherry Trail mixes! What would you add to yours? Check out just how simple it is to make all three versions of tart cherry trail mix! 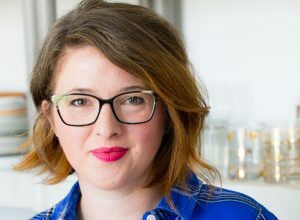 For more information and inspiration on how to bring tart cherries into your life, visit ChooseCherries.com and follow Choose Cherries on Facebook, Twitter and Pinterest. Preheat oven to 250 degrees. Spread nuts, cereal and pretzels on a rimmed baking sheet. Drizzle with lime juice and sprinkle with chili powder. Toss to coat. Bake for 35-45 minutes, stirring every 15 minutes or until mixture is dry and roasted. Allow to cool. Stir in tart cherries. Store leftovers in an airtight container. Emily, I absolutely LOVE your video!!!! I want to eat it all!!!! love!! Thank you so much, Alice!